With the cooler weather coming in…well kind of in Florida. 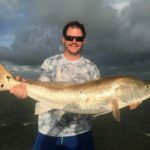 This has the big BULL REDS on fire in Port Orange and Daytona Beach. This also has the Snook, Jacks, Flounder and other game fish on the hunt to feed in the Halifax River. Since the hurricane the Tomoka Basin in Ormond Beach is full of Snook and slot Redfish. This is one of the best times to be out and on the water. Book now and do not miss your chance at a fish of a lifetime.